Parents from our parent groups across the Bi-borough have proposed a range of questions across education, health and social care that they would like to have answered. In our new Parent Zone, we publish these questions alongside answers from staff at the Local Authority and our partners. Parent Carer Support Groups are a helpful source of information and guidance as well as support for families of disabled children. Parent support groups keep parents and carers informed through coffee mornings, events, websites, training and workshops. They give free practical independent advice to parents and young people. The local Parent Carer Support Group for Westminster is Make it Happen (formerly WPPG). Make it Happen are a group of parent volunteers working together to help improve services for children and young people with SEND in Westminster. They come together to put forward concerns about the services being provided and are actively consulted by various local service providers. The group hold weekly drop-in sessions for parents/carers offering a relaxed environment to share experiences, offer advice, and find out about the support available in the local area. Drop-ins run at Bessborough Family Hub on Tuesdays, and LDN Living, Harrow Road on Thursdays, both from 10am – 12pm (term time only). Access to the MAX Card scheme, a discount card on days out for families of children with SEND. train parents on using the Local Offer website and assist with any problems navigating the site. collect parent feedback on the Local Offer website allowing improvements to be made. ensure parent carer representation in plans to develop the website. To contact a Local Offer Parent Champion or to volunteer to become one yourself, please contact the group. 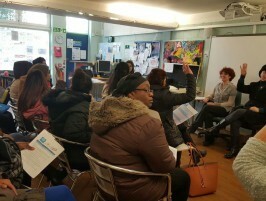 The Information, Advice and Support Service (IASS) is a free confidential service available to parents, children and young people who live in Kensington and Chelsea. Education, Health and Care Plans (EHCPs). Any information and advice provided is independent of the Local Authority. The IASS can also support with individual casework, including filling in forms, support in preparing for meetings, resolving disagreements, and signposting to local or national support services. You can find out more about the IASS for Westminster and find out how to get in touch by clicking here. All local authorities are legally required to have an independent service to help in situations where parents/carers, young people, schools, health care services and the local authority cannot agree on how to meet a child/young person’s needs. This service is called a mediation and dispute resolution service. ‘KIDS’ is an organisation contracted through the Local Authority to deliver mediation advice and support. You can speak to a mediation advisor by calling 0207 359 3635. For more information on the mediation and disagreement process, please click here.